Now is the best time to join SlotsMagic. Now only have they made some major changes to their website and their bonuses, they now also have a very special deal. If you join SlotsMagic now you will get 10 free spins on Starburst, no deposit needed. But there is more. 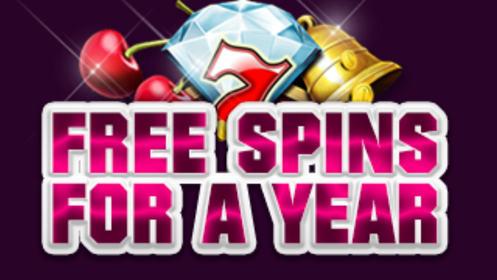 How about weekly free spins, no deposit needed, for a year. All you need to do is make a minimum deposit of €50,- and use bonus code Y520 when doing so. This will award you with a 100% bonus up to €100,-. 50 free spins instantly and weekly free spins for a year. Every week on Thursday or Friday you will receive 10 free spins, 52 weeks long. So 520 free spins in total for only a €50,- deposit. And the best thing, no wagering on free spins winnings, ever! Another great thing about the new and improved SlotsMagic. Wagering requirements on bonuses have been lowered to 25 times the bonus amount and same day withdrawals on all winnings. At SlotsMagic you are able to play games from NetEnt, Williams Interactive and some other providers. And they offer all WMS games, not just a selection. So visit SlotsMagic now for 10 no deposit free spins, make a deposit and get 10 no deposit free spins each week for a year!